The Fisher Delta Research Center is based in Portageville, MO, about 290 miles southeast of Columbia, in Missouri’s Bootheel. The five field locations of the Center total 1094 acres:: 660 at the Lee Farm, 260 at the Marsh and Bay Farm, 70 at the Cavanaugh Farm, 80 at the Rhodes Farm, and 24 at the Senath Farm. The Center is part of the Missouri Agricultural Experiment Station and contributes significantly to the land-grant mission of the University of Missouri for the Bootheel of Missouri. The focus of the research is the primary crops grown in Missouri’s delta: soybean, corn, cotton and rice. The Center also maintains a regional soil and plant testing laboratory. 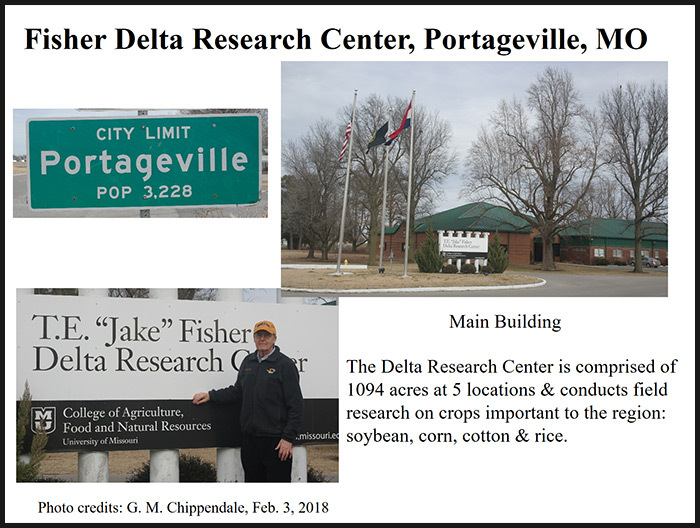 The Delta Research Center is featured here because the maize plots at the Lee Farm were the source of the southwestern corn borer, Diatraea grandiosella, that G. M. Chippendale used when he was a researcher and teacher at the University of Missouri, Columbia. Southern Missouri is the northern limit of the distribution of this species. From 1970 to 2002, together with his colleagues, students, and staff, he published 80 research articles on different aspects of the physiology, biochemistry, ecology and management of the southwestern corn borer, Topics included were nutrition, feeding behavior, growth and development, endocrinology, photoperiodism, and biorational control. A complete listing of these research articles is provided under the communications tab of this website.